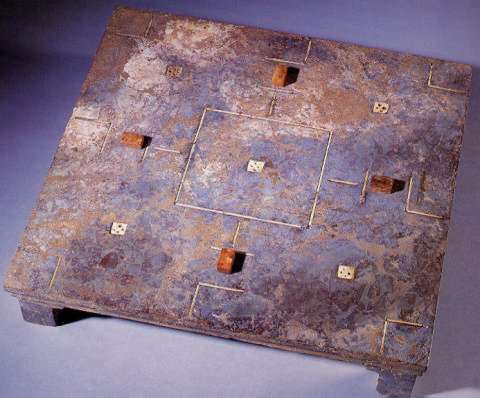 A large number of Liubo boards and associated game equipment have been found as grave goods in Warring States period (476–221 BCE), Qin dynasty (221–207 BCE) and Han dynasty (206 BCE – 220 CE) tombs from all across China, from Beijing in the north to Guangzhou in the south, from Gansu in the west to Jiangsu in the east. Although far from every tomb from this period contains a Liubo board, Liubo equipment does seem to have been one of the standard items that was regularly included amongst the grave goods, and exquisite quality lacquered Liubo sets are especially common from the tombs of nobility from the Western Han period (206 BCE – 25 CE). The vast majority of Liubo boards are made from lacquered wood, frequently with the board design marked out with inlaid materials such as ivory, bone, horn or silver, but Liubo boards made from stone and bronze are also known. 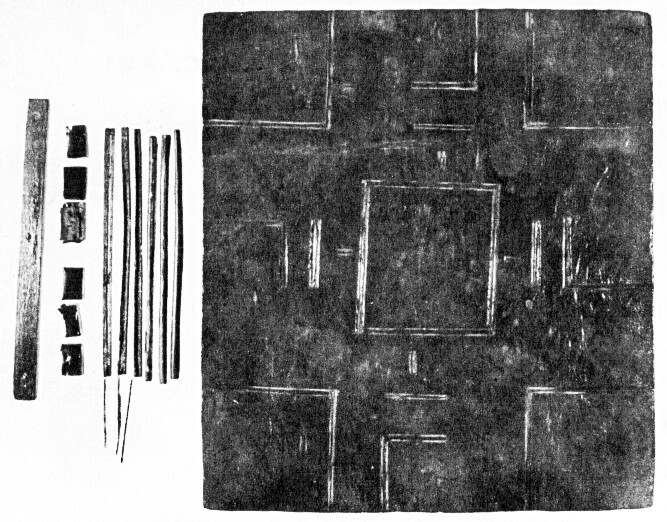 Due to the ease of decomposition of wood, in some cases the wooden Liubo board in a tomb has entirely decomposed away, but the associated game pieces, often made of more durable material such as jade or crystal, have survived as evidence that there was originally a Liubo set in the tomb. 博 or 簙 bó. 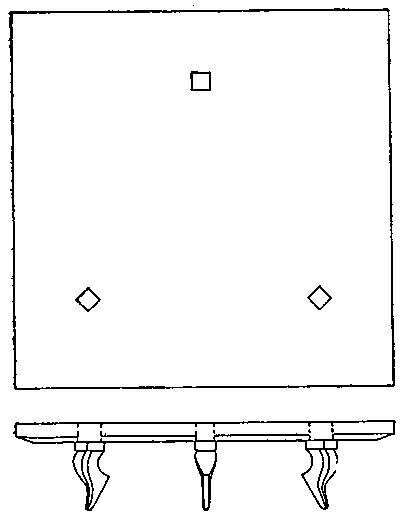 These are the six throwing sticks that were used to determine the player's move. They were usually made of thin bamboo rods split in half lengthwise (and coated with laquer or strengthened with metal strips or wire), so that when thrown the combination of rounded-side up or flat-side up sticks showed the move. 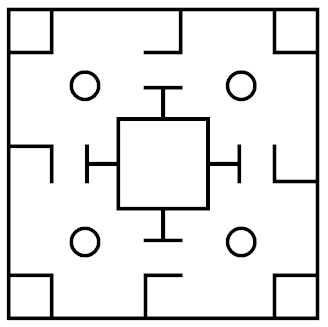 The value of the move may have been determined by interpretting the six sticks as the lines making up a hexagram, with the rounded-side up representing a yang (unbroken) line and the flat-side up representing a yin (broken) line. 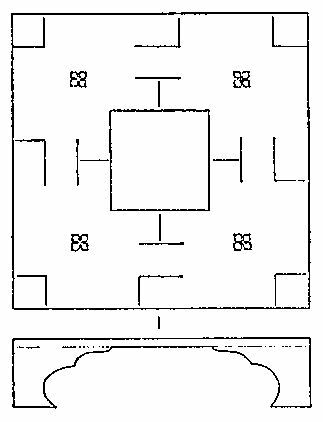 Thus, each throw of the sticks would give one of 64 hexagram positions which would then determine how the game pieces were moved. Most sets include only six throwing sticks, indicating that the players must have shared the throwing sticks, although the de luxe set from Mawangdui includes twelve throwing sticks. 筭 suàn. These are the counting rods that were used to keep score of the game. 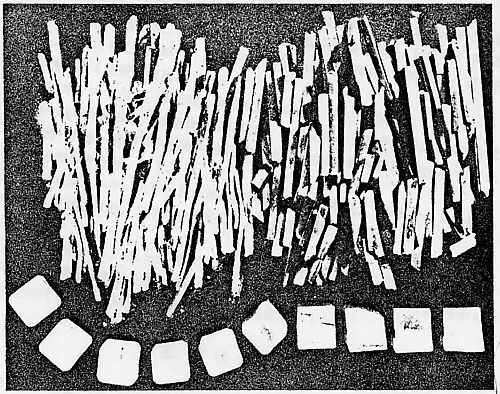 These were made out of ivory, silver, lead or bamboo, and were usually thirty in number, although there is some variation in how many counting rods are found in different sets. 棊 qí. These are the game pieces that were moved around the Liubo board by the players. Most sets have twelve cubic or cuboidal game pieces of two colours (usually black and white), six for one player and six for the other player. They are made from a variety of materials, including wood, bone, stone, jade, crystal and ivory, and a Liubo set may include six game pieces made from one material and six made from a different material. 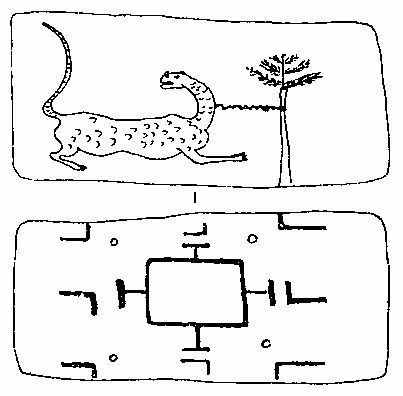 In one case the game pieces are made of the same material, but differentiated by having a tiger engraved on one set of pieces, and a dragon engraved on the other set of pieces. There is some variation in the number of game pieces, with as few as eight pieces (2 × 4) or as many as eighteen pieces (2 × 9), and in some sets one or two pieces are a larger size than the other pieces. 局 or 梮 jú. This is the game board upon which the game pieces are moved. 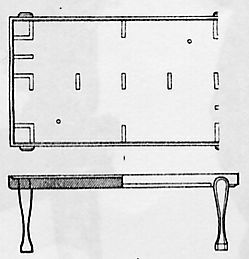 Most boards are square with four short legs, but some boards are table-like with three or four long legs, and a very few are rectangular is shape. Some boards incorporate a compartment for storing the throwing sticks, counting rods and game pieces. All boards have distinctive markings which are referred to as 曲 qū, comprising a right-angled shape at each corner and at the centre of each side, and a square in the centre of the board, with a T-shaped protrusion on each side. 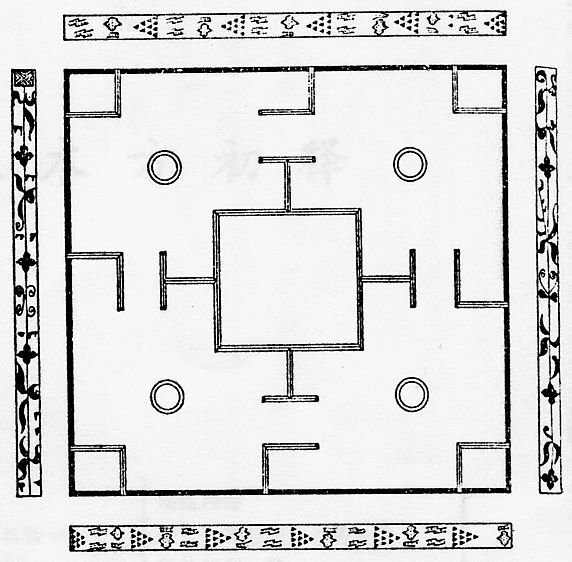 Between each corner of the central square and the corner right-angle mark is a variable-shaped mark, most commonly a circle, but sometimes a square or a triangle or a four-leafed design or an animal design or simply a diagonal line. 博席 bóxí. This is the mat placed next to the Liubo board upon which the throwing sticks are cast. 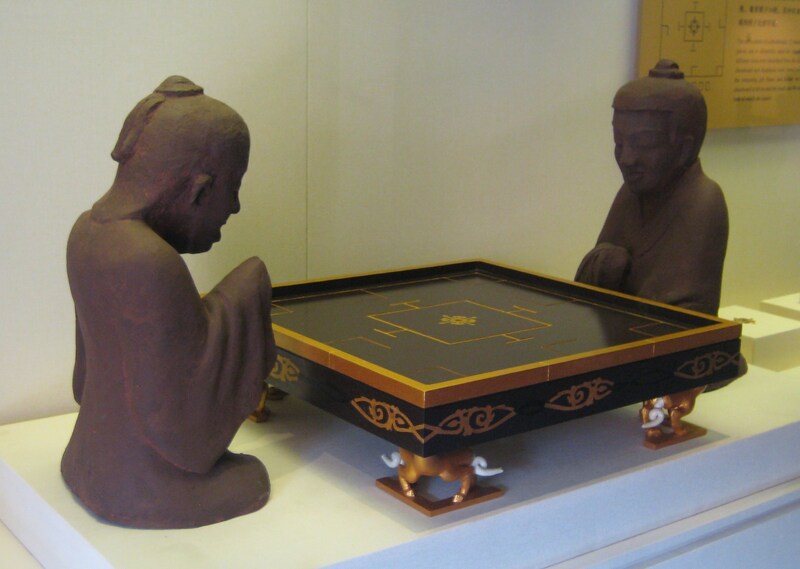 As mats is made from perishable material they are not usually preserved, but they are shown in most pictures of Liubo players. Black lacquered wooden Liubo board (42.0 × 42.0 cm.) 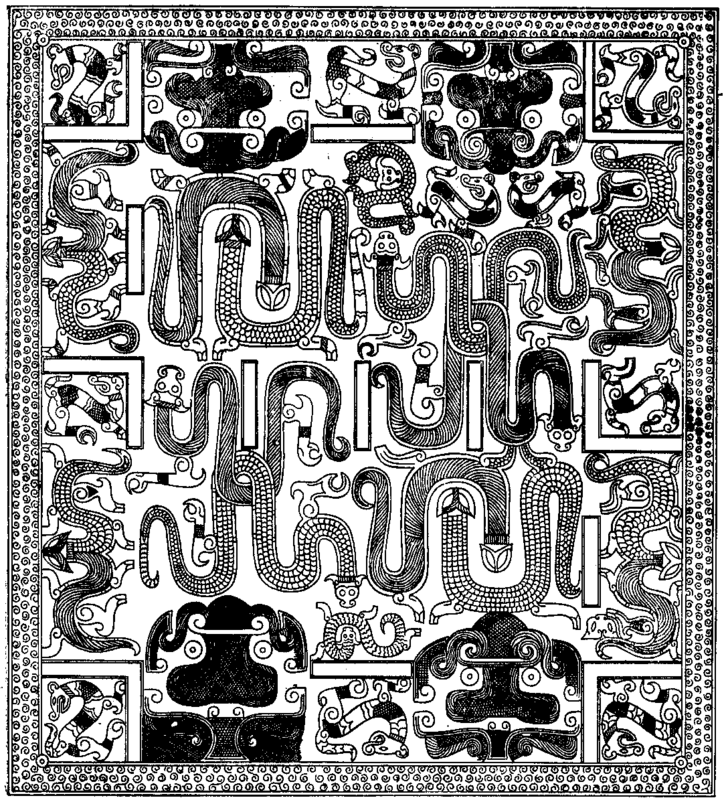 with four low legs, decorated with red cloud patterns and four pairs of male figures facing each other. Two sides of the board are fitted with a drawer. 18 silver counting rods (22.8 × 0.4 × 0.2 cm.) from inside the drawers. Description : Eight cuboidal ivory game pieces (3.1 × 1.5 × 1.2 cm. ), four engraved with pictures of dragons on each face, and four engraved with pictures of tigers on each face. References : 《北京大葆台漢墓》 (文物出版社, 1989年). Description : Wooden board (12.7 × 5.8 × 0.3 cm.) with a painting of a tiger tied to a tree on one side, and a Liubo game pattern on the other side. 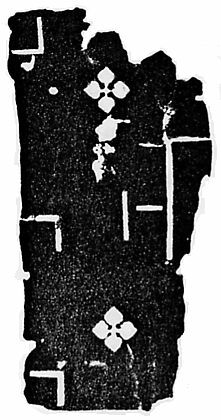 Description : Fragment of a lacquered wooden Liubo board. 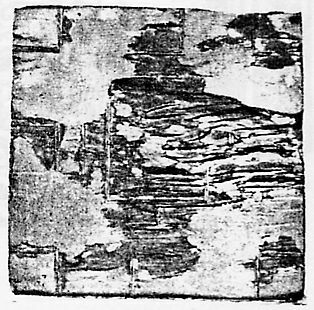 References : 《廣州漢墓》 (文物出版社, 1981年). Current Location : Museum of the Mausoleum of the Nanyue King, Guangzhou. Date : Early Western Han (206 BCE – 25 CE), 122 BCE. 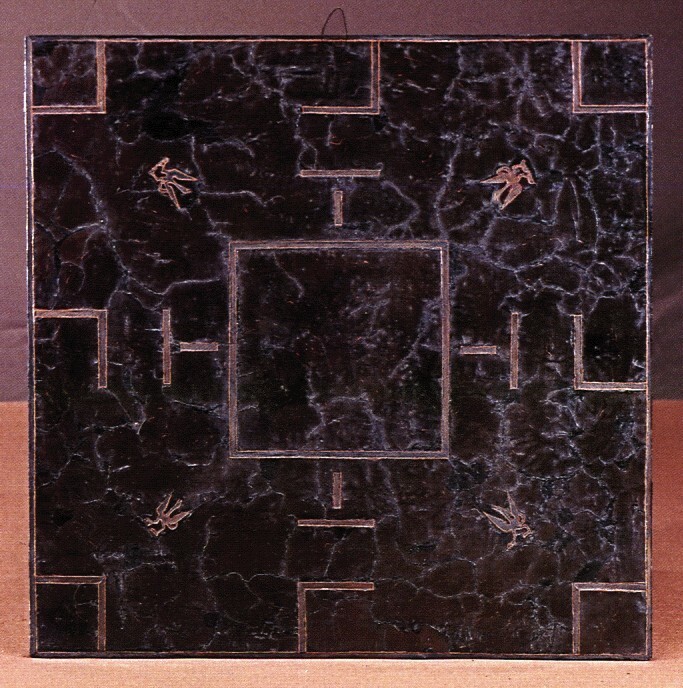 Bronze frame of an almost completely decayed brown lacquered wooden Liubo board with four short legs (B30, B42, B43, B44, B53, B54; circa 60.0 × 60.0 × c.13.0 cm. ), together with thirteen pieces of gold inlay in the form of swirling clouds (B33; 11.0 × 4.0 cm.) that would have been used to decorate the sides and top of the game board. 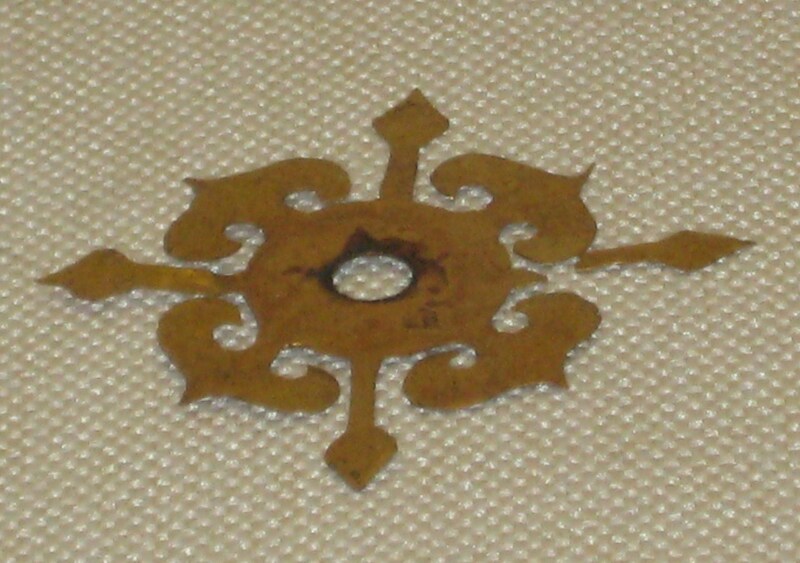 Bronze frame of an almost completely decayed brown lacquered wooden Liubo board (B73, B81; circa 49.0 × 49.0 × 1.7 cm. ), together with four circular silver sheets (B82; 2.5 cm. 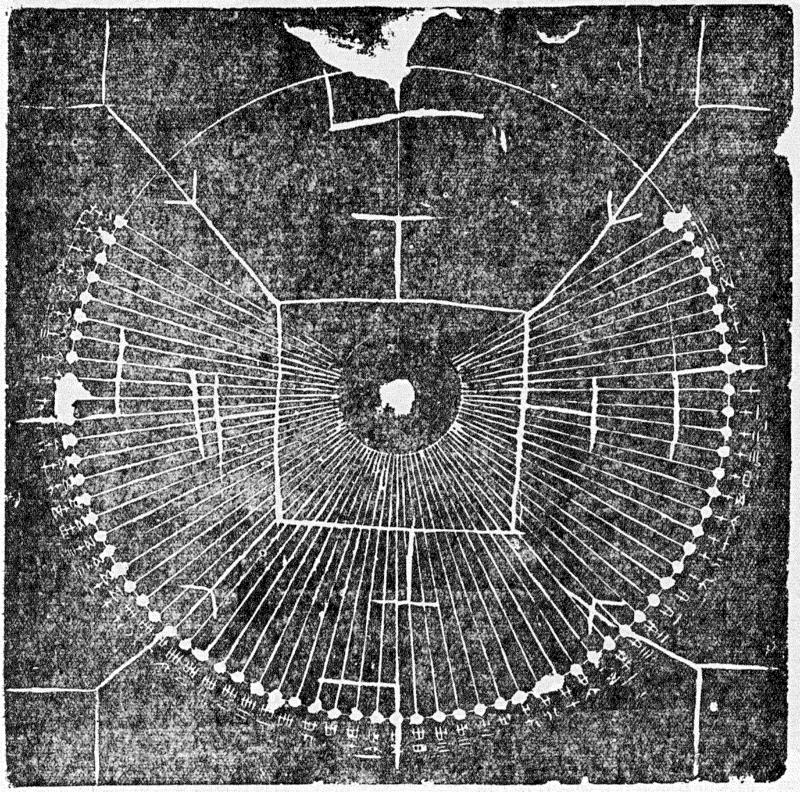 in diameter) that would have been used as designs on the board. 6 crystal game pieces (B74, B75, B93) and 6 jadeite game pieces (B92; 3.3 × 2.0 × 1.3 cm.) that would have belonged with one of the two Liubo boards. Bronze frame of a completely decayed lacquered wooden Liubo board (E112; circa 58.0 × 52.0 × 1.7 cm. ), together with a lacquered wooden box containing twelve ivory game pieces. Bronze frame of a completely decayed lacquered wooden Liubo board (E113; circa 40.0 × 40.0 cm. 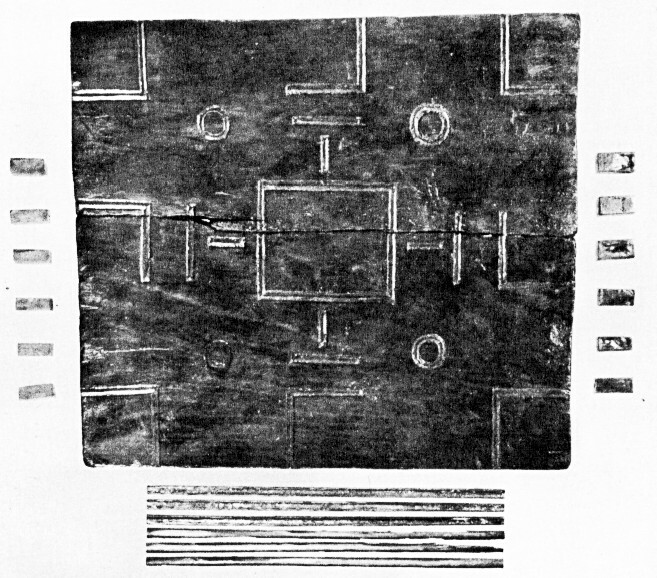 ), together with six red-stained ivory game pieces (E114). References : 《西漢南越王墓》 (文物出版社, 1991年). Description : Wooden Liubo board, with two sides missing (38.0 × 20.0 × 0.5 cm.). 博具一笥, 繒緣, P [sic] "Liubo set in one box, with silk borders, 'P'"
References : 《廣西貴縣羅泊灣一號墓發掘簡報》 (《文物》1978.9); 《廣西貴縣羅泊灣漢墓》 (文物出版社, 1988年). 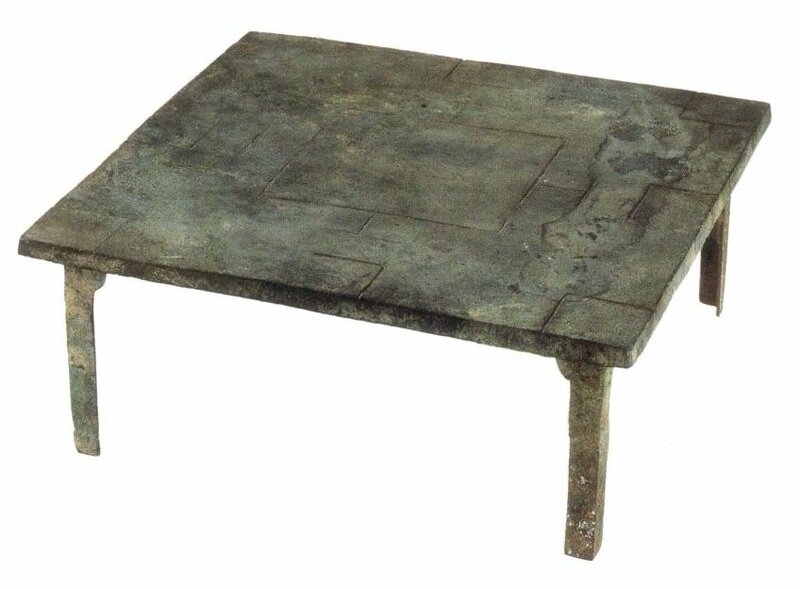 Description : Bronze Liubo table with four long legs (30.0 × 29.0 × 9.0 cm.). Description : Two Liubo boards (45.0 × 45.2 cm.) made from a number of slabs of stone joined together, with an intricate pattern of mythical creatures, tigers and snakes. Description : Lacquered wooden Liubo board with three short legs (32.5 × 32.0 × 7.4 cm.). References : 《湖北鄂城鄂鋼五十三號墓發掘簡報》 (《考古》 1978.4); 《鄂城楚墓》 (《考古學報》 1983.2). Wooden Liubo board (21.8 × 21.1 × 1.9 cm.). 12 cuboidal bone game pieces (2.1 × 1.4 × 1.1 cm. ), 6 black in colour, 6 greyish white in colour, stored in a round lacquer container. 6 black lacquered bamboo throwing sticks (23.7 × 0.9 cm.). 博、筭、綦、梮、博席一具，博囊一。 "Liubo [throwing sticks], counters, game pieces, game board, game mat one set, and one Liubo bag." Description : Rectangular black lacquered wooden Liubo table with four long legs (34.6 × 20.5 × 12.5 cm.). Current Location : Jingzhou Museum. 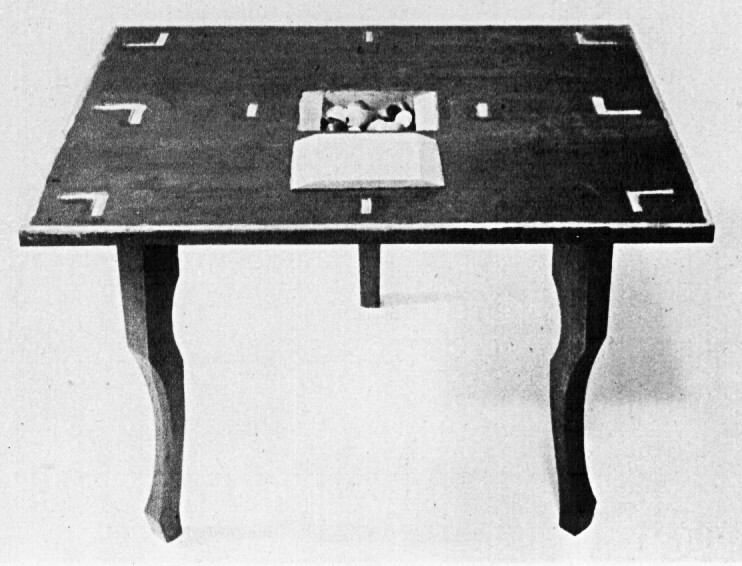 Lacquered wooden Liubo table with four long legs stored in compartments on two sides of the board (45.4 × 40.4 × 28.2 cm.). The game dessign is inset into the board surface with bone or horn. 18 cubic game pieces, 9 coloured black and 9 coloured white. Black lacquered wooden Liubo table with three long legs (39.0 × 32.7 × 24.0 cm. ), with the edges and game design marked out in red lacquer. In the middle of the board is a rectangular compartment (9.0 × 6.3 × 0.9 cm.) used for storing the game pieces, with a lid that is flush with the surface of the board. 24 game pieces made from pebbles, 9 coloured red, 9 coloured black and 6 coloured white. References : 《江陵雨台山楚墓》 (文物出版社, 1984年). 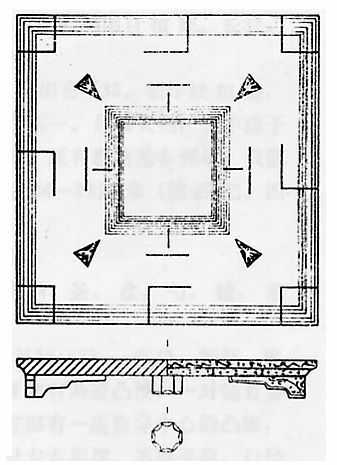 Description : Apparently a Liubo board similar to the one found in Tomb M314. Description : Lacquered wooden Liubo board (38.0 × 36.0 × 2.0 cm.) with the game design marked in red lacquer. 博一具。 "One set of Liubo [throwing sticks and game pieces]." 䰍洀畫曲一。 "One lacquered board with painted Liubo game designs." Wooden Liubo board (23.0 × 29.0 × 2.0 cm.). 12 black lacquered bone game pieces, 6 cubic (1.4 × 1.4 × 2.4 cm.) and 6 cuboidal (1.4 × 1.0 × 2.4 cm.). 6 bamboo throwing sticks filled with metallic powder (23.5 cm. long). References : 《湖北雲夢睡虎地十一號秦墓發掘簡報》 (《文物》1976.6); 《雲夢睡虎地秦墓》 (文物出版社, 1981年). 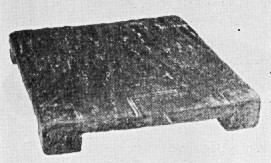 Wooden Liubo board (38.5 × 35.0 × 3.3 cm.) with four circles marked with red lacquer. 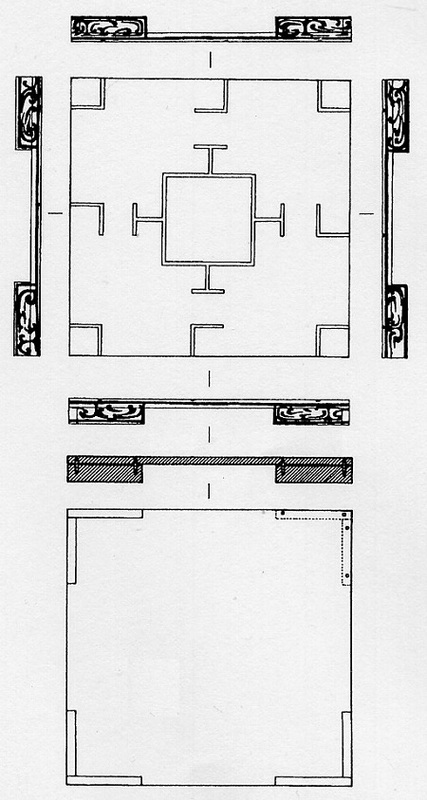 A compartment (24.0 × 6.0 × 1.8 cm.) in one side of the board was used to store the game pieces and throwing sticks. 6 bone game pieces, 1 large piece coated in red lacquer (3.0 × 1.4 × 2.0 cm.) 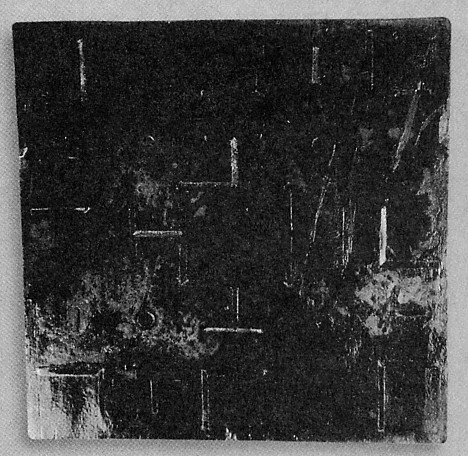 and 5 smaller pieces coated in black lacquer (2.5 × 1.2 × 1.7 cm.). 6 bamboo throwing sticks bound with copper wire at each end, and filled with metallic powder (19.5 cm. long). 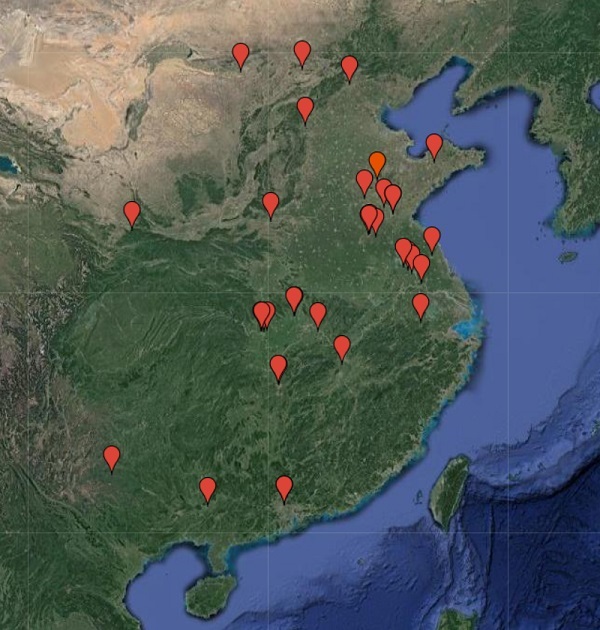 References : 《湖北雲夢睡虎地十一座秦墓發掘簡報》 (《文物》1976.9); 《雲夢睡虎地秦墓》 (文物出版社, 1981年). Current Location : Hunan Provincial Museum. A black lacquered wooden game box (45.0 × 45.0 × 17.0 cm.). A black lacquered wooden flat game board (45.0 × 45.0 × 1.2 cm.). 12 cuboidal ivory game pieces (4.2 × 2.2 × 2.3 cm. ), six black and six white. 20 ivory game pieces (2.9 × 1.7 × 1.0 cm.). 30 ivory counting rods (16.4 cm. long). 12 ivory throwing sticks (22.7 cm. long). One ivory knife (22.0 cm. long). One ivory scraper (17.2 cm. long). An eighteen-sided die with the numbers "1" through "16" and characters meaning "win" and "lose" (not listed in the inventory of grave goods). 博一具 "one set of Liubo"
象其十二 "twelve ivory game pieces"
象直食其廿 "twenty ivory 'straight eating' game pieces"
象□□□□ (last four characters obliterated) "[twelve] ivory [throwing rods]"
References : 《長沙馬王堆二、三號漢墓發掘簡報》 (《文物》1974.7); 《馬王堆漢墓文物》 (湖南出版社, 1992年). Description : Brown laquered wooden Liubo board (28.0 × 28.0 × 6.8 cm.) with four low legs. 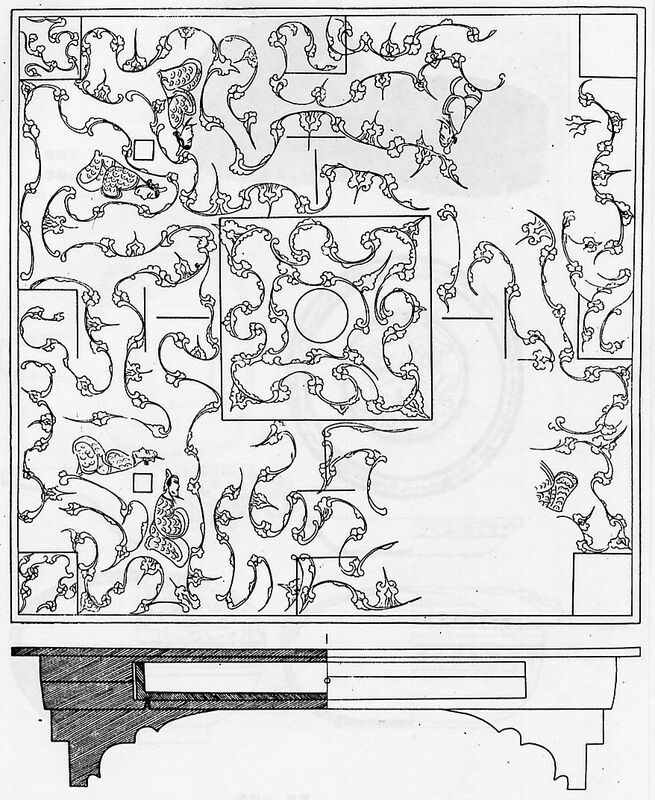 The border of the playing surface, the sides and the legs are decorated with geometric patterns, swirling cloud patterns, feathered immortals and mythical creatures. Description : Black lacquered wooden Liubo board with four short legs, with the game design marked in red lacquer (39.0 × 39.0 × 6.5 cm.). Black lacquered wooden Liubo board (40.0 × 40.0 × 9.5 cm.) with four low legs. The sides and legs are decorated with green patterns and pictures of mythical creatures. A rectangular lacquered wooden box (30.0 × 29.0 × 7.7 cm. ), with black lacquer outside and red lacquer inside, divided into three compartments. An uncertain number of cuboidal wooden game pieces (3.0 × 1.5 × 1.5 cm.) from inside the box. 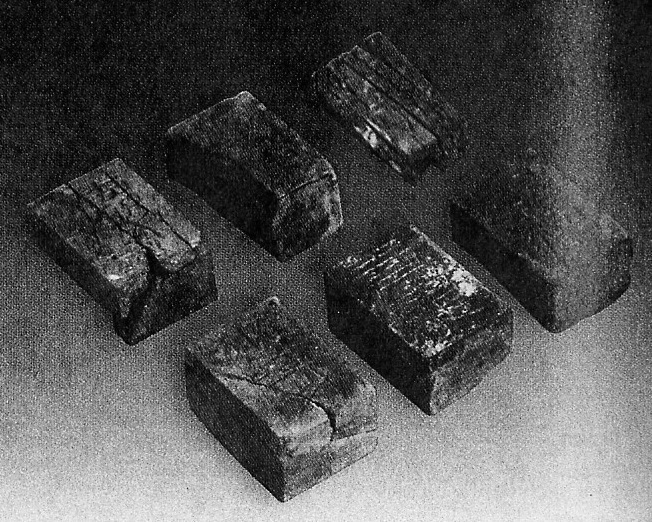 An uncertain number of lead counting rods (23.0 × 0.4 × 0.2 cm.) from inside the box. Current Location : Xuzhou Museum. Description : 12 cuboidal bone game pieces (3.5 × 2.1 × 1.45 cm.). 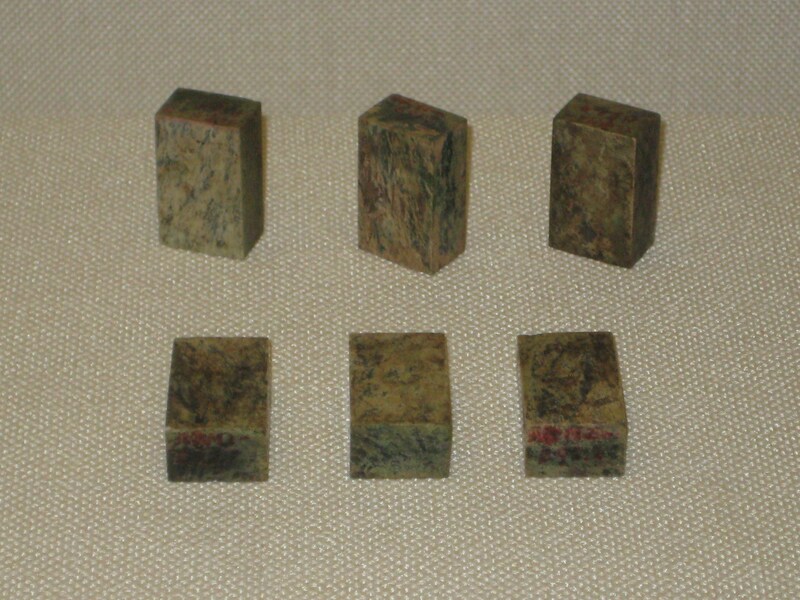 Description : 11 bone game pieces (2.25 × 1.3 × 0.6 cm.). Date : Western Han (206 BCE – 25 CE), circa 175–154. Description : Wooden Liubo board. 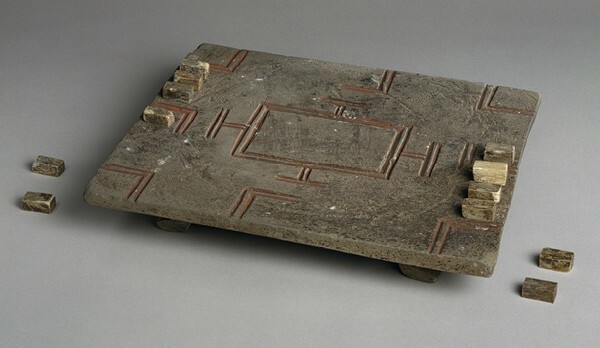 Description : Stone Liubo board with four short legs. References : 《山東文物選集》 (文物出版社, 1959年). 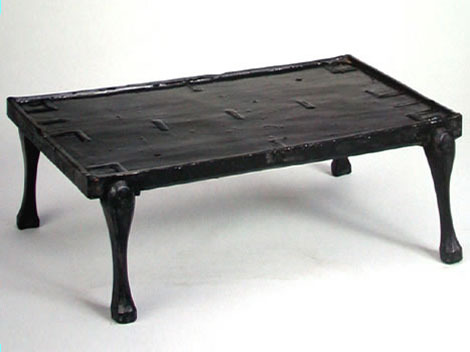 Black lacquered wooden Liubo board with four short legs (37.0 × 37.0 × 7.3 cm.) with the game design marked in red lacquer. Lacquered wooden box (42.5 × 42.5 × 9.0 cm.) containing a wooden Liubo board (39.0 × 39.0 cm.) made out of five pieces of wood, with the game design inlaid with horn. 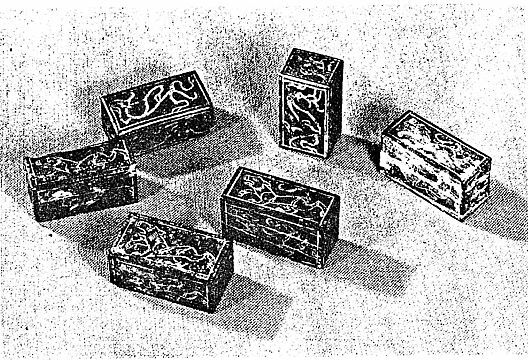 8 cuboidal wooden game pieces with missing inlay, of which 2 are large-sized (3.2 × 1.4 × 0.6 cm.) and 6 are small-sized (2.5 × 0.7 × 0.3 cm.). 30 silver counter sticks (22.0 × 0.5 × 0.2 cm.) with the remains of a brown lacquer coating. Black lacquered wooden Liubo board (41.7 × 41.7 × 5.2 cm.) 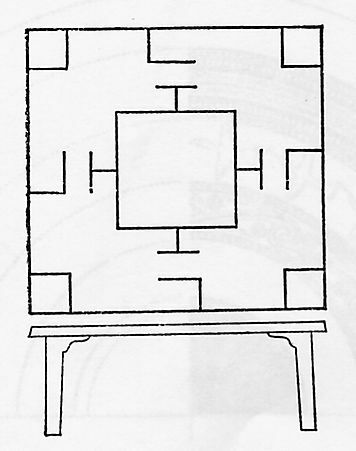 with four short legs and a central column under the middle of the board. The board and legs are decorated with red, yellow and white cloud patterns and geometric patterns. 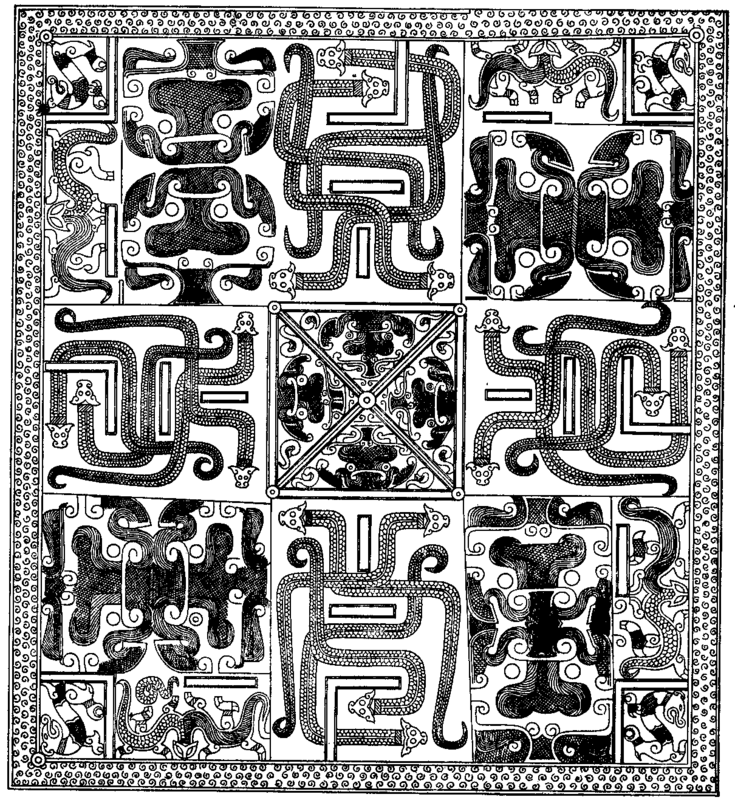 The game design is inlaid with horn, with four triangular designs inlaid with wood engraved with the image of a bird. 12 cuboidal wooden game pieces (3.0~3.2 × 1.7~2.0 × 1.5 cm.) 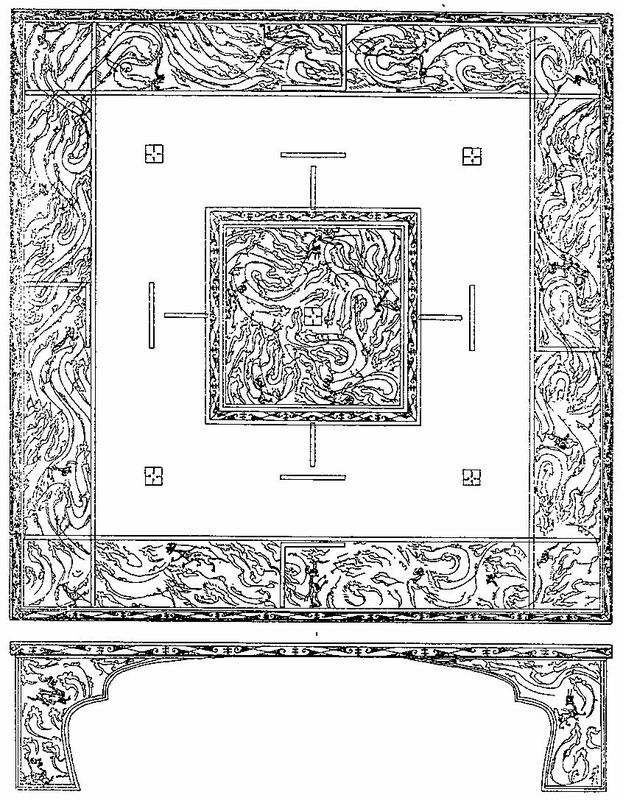 with inlay and/or decorated patterns. A number of silver counting rods (22.5 × 0.6 × 0.2 cm. 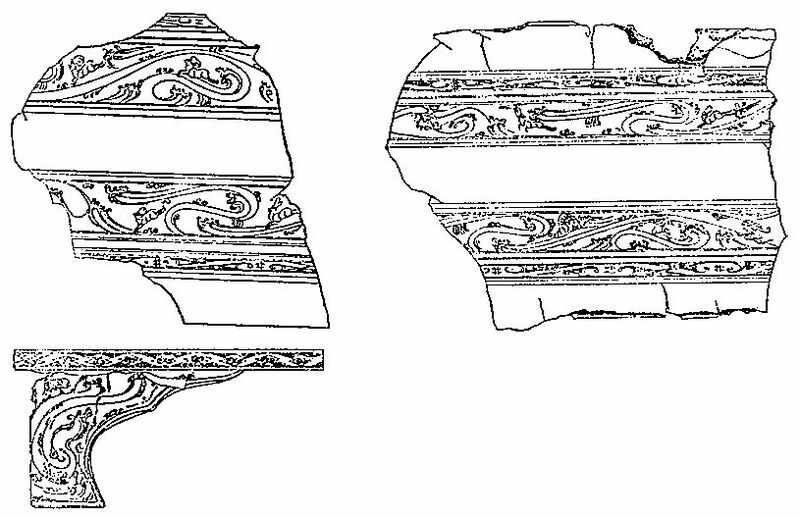 ), some lacquered with decorative patterns (50 counting rods in total from tombs M31 and M33). Black lacquered wooden Liubo board. Description : Wooden Liubo board (30.0 × 30.0 × 5.0 cm.) with four low legs, and the game design marked with grooves filled with white powder. 6 jadeite cubic game pieces. 6 ivory cubic game pieces. A bunch of silver counting rods. A bunch of ivory counting rods. References : 《曲阜魯國故城》 (齊魯書社, 1982年). 6 jade cubic game pieces. 6 white stone cubic game pieces. 6 grey stone cubic game pieces. Provenance : Somewhere in Shaanxi (presumably from a robbed tomb). Current Location : E&J Frankel, Ltd., New York. 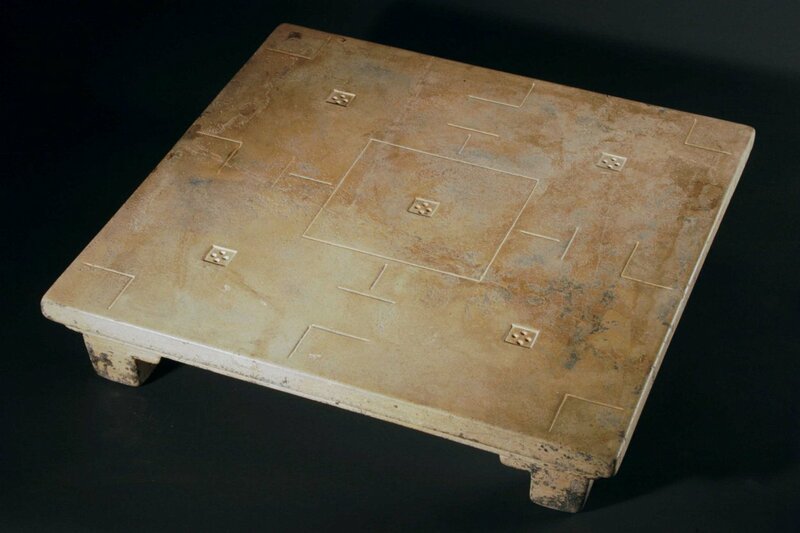 Description : Limestone Liubo board (45.5 × 45.5 × 8.9 cm.). References : E&J Frankel, Ltd.
Provenance : Unknown (presumably from a robbed tomb). Current Location : Unknown (private collection?). Puddingstone Liubo board (41.5 × 41.5 cm.) inlaid with bone. 4 ivory game pieces (2.5 × 2.5 cm.). Provenance : Luoyang (? ), Henan. Current Location : Metropolitan Musuem of Art, New York. 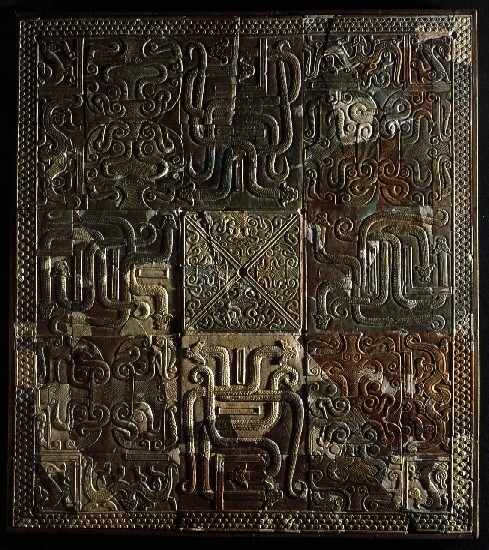 Earthenware Liubo board (36.2 × 36.2 cm.). 12 cuboidal bone game pieces. Black lacquered wooden Liubo board (42.0 × 42.0 × 1.0 cm.). 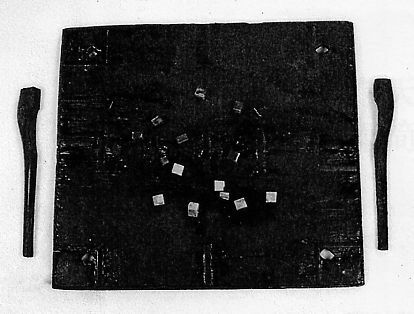 9 cuboidal undecorated black lacquered wooden game pieces (1.5 × 1.0 × 0.6 cm.). Laquered wooden Liubo board with bone inlay; only the lacquered bone inlay from the corners, the centre square and the central flower pattern remain. 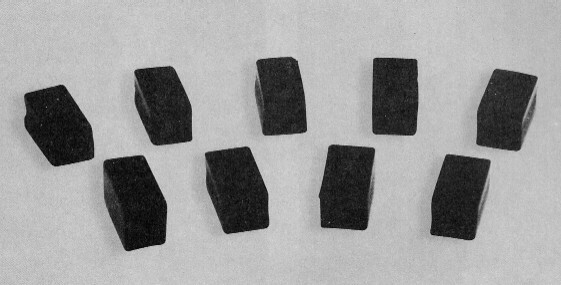 12 cuboidal bone game pieces (2.0 × 1.5 × 3.6 cm.). 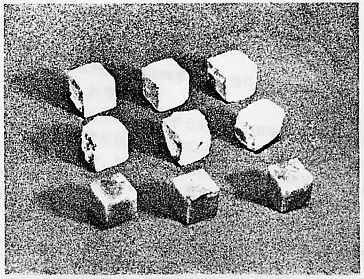 6 cuboidal bone game pieces (3.8 × 2.2 × 1.9 cm. ), undecorated. 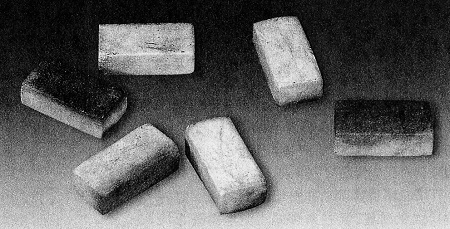 6 cuboidal bone game pieces (2.8 × 1.8 × 1.4 cm. ), engraved with the Chinese characters 青龍 (qīng lóng "green dragon"), 小歲 (xiǎo suì "little year"), 德 (dé "virtue"), 皇德 (huáng dé "august virtue"), 司陳 (sī chén), and 白虎 (bái hǔ "white tiger"). 2 bundles of bone counting rods (7.6 cm. long), coated in reddish-brown lacquer. 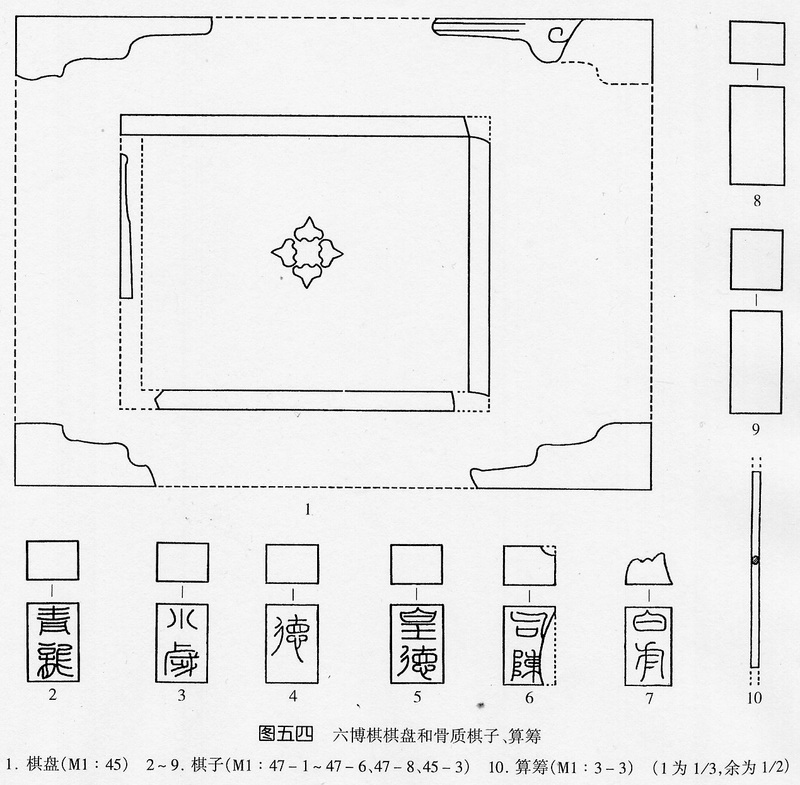 Notes : The remains represent two Liubo sets. 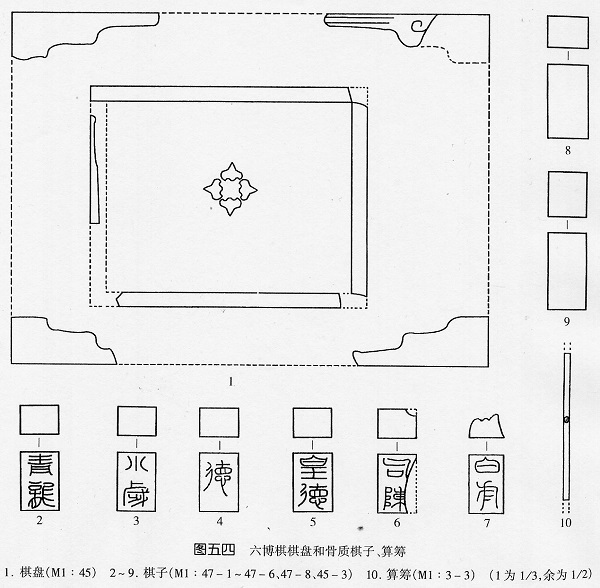 The bone inlay from the Liubo board and 12 bone game pieces (M1:45) are from one set, and the two sets of 6 bone game pieces (M1:47) are from another set. Lacquered wooden Liubo board (43.2 × 43.2 × 4 cm.). 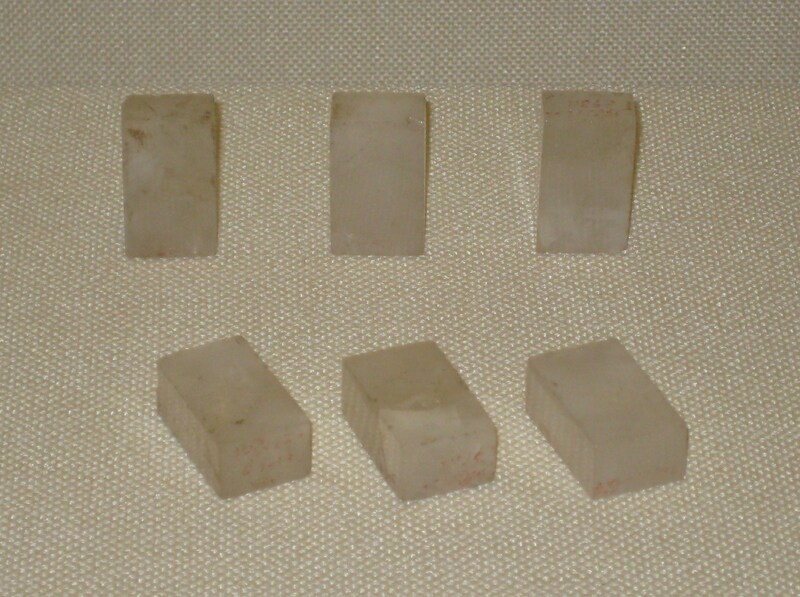 6 cuboidal white bone game pieces (3.5 × 1.6 × 1.0 cm.). 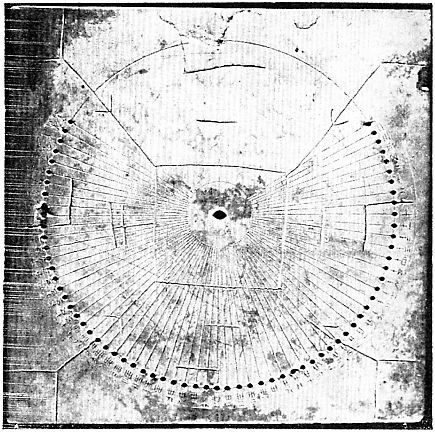 Only two Han dynasty stone sundials are known, yet oddly enough both of them have Liubo game markings crudely engraved over the original sundial design, and so were apparently repurposed as Liubo game boards. Current Location : National Museum of China, Beijing. 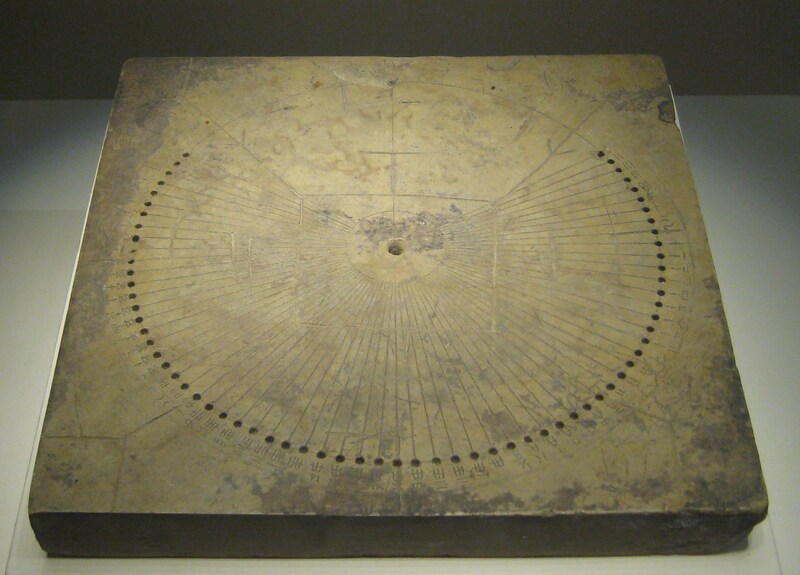 Description : Stone sundial with Liubo game design engraved over the sundial markings (27.4 × 27.4 × 3.5 cm.). References : 孫機, 《托克托日晷》 (《中國歷史博物館館刊》1981.3: 74–81). Current Location : Royal Ontario Museum, Toronto [933.12.2]. 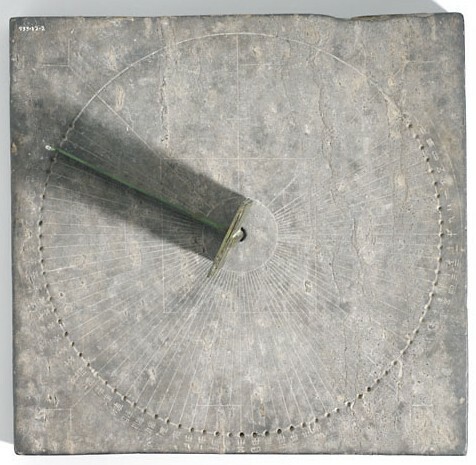 Description : Limestone sundial with Liubo game design engraved over the sundial markings (27.5 × 28.5 × 3.2 cm. ).